Today the gauntlet has been thrown and a challenge has been set to all men across the globe by YGAP to become a Polished Man. I don’t mean scrubbing up and getting your suit out of the back of the wardrobe. 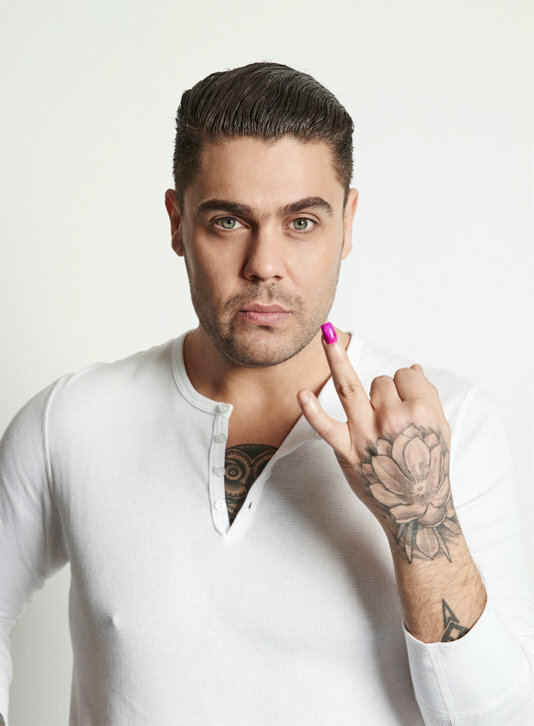 Quite simply, during the 1-15 of October you are asked to paint one fingernail to raise awareness of the global problem of violence against children, and to represent the 1 in 5 children who experience violence globally. I asked Elliot where the inspiration for Polished Man came from. “I was inspired to launch the Polished Man after a visit to YGAP’S project partner Hagar International in Cambodia. One evening I met a young girl named Thea, due to the language barrier we couldn’t talk but we could play games. At the end of the evening, Thea drew a heart on my palm and painted all my fingernails blue. The following day I heard how Thea came to be in Hagar’s care. When she eight, her father, the family’s sole provider, passed away, and her mother sent Thea to an orphanage, hoping to give her safe refuge, she received anything but a safe place to live; Thea was physically and sexually assaulted on a daily basis for two years by the orphanages director. I will admit I did feel uncomfortable wearing nail polish at first. But, I found it created the perfect opportunity to talk about the important issue of ending violence against children. In Australia alone in 2011-12 there were 170,000 reports of child abuse (emotional neglect, physical and sexual abuse) this equals 1 in 28 children with more than 80% of perpetrators known to the victims including, Fathers, Stepfathers, Relative, family friends, acquaintances or neighbours. Globally 1 in 5 children are affected by violence before the age of 18. While most men don’t perpetrate violence against children, approximately 90% of sexual violence committed against children is perpetrated by men. The bulk of this violence happens behind closed doors and is committed by people known to the child. So Elliot’s question “Why is the majority of violence against children committed by men, and how can we end this violence” really needs to be answered. I asked him how the Polished Man campaign can help to find that answer. “The Polished Man campaign which launched in Australia in 2014, reached an audience of 58 million people creating awareness around the severity of the problem and inviting people to stop violence by taking part in the campaign. This year we are taking the campaign global to further extend this message, YGAP believes that men all over the world have a leading role to play in ensuring children feel safe and reach their full potential. Funds raised from the campaign will directly support children affected by violence, while also investing in preventative measures to help end children at risk of experiencing violence. Yes? Then grab a bottle of nail varnish and choose a digit to decorate. Don’t be shy in asking for help to apply. Single? No problem. Go and buy a bottle from any pharmacy, it's not expensive. Get people talking and asking the question. Together you and other polished men will make a difference. Hagar international- economic empowerment program supports young survivors to break free from violence by providing vocational training, life skills, employment opportunities and leadership training. We endeavour to solve social issues by finding and enabling local impact entrepreneurs across Africa and Australia. By giving local impact entrepreneurs access to funding and core business support, ygap enables those addressing violence against children to scale their initiatives and increase their impact.